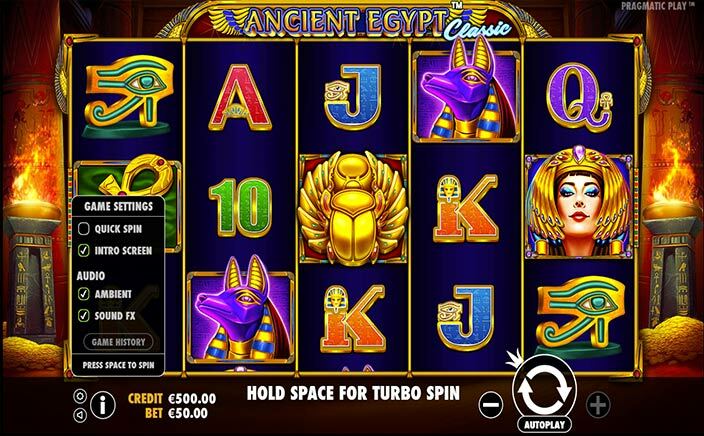 Ancient Egypt Classic is a slot designed by Pragmatic Play featuring 5 reels and 10 paylines. Get ready to experience a trip to the land of Pharaohs that has some truly amazing bonus rounds and free spins. 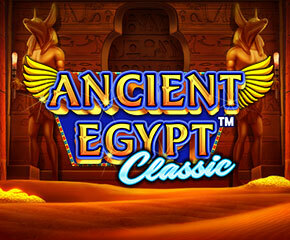 The stake in Ancient Egypt Classic begins at 10p and goes up till £50 for every spin. The pretty and colourful design is attractive enough to catch everyone’s eye. The reel backdrop is an ancient pyramid and the reels are flanked by flaming torches and pillars designed ornately. A lot of gold is visible that gives the players a luxurious feel. The symbols of Ancient Egypt Classic includes playing cards from A up to 10 and other theme related symbols. Out of them, the hieroglyphs are highly rewarding. The ankh and Horus’s eye will pay you 75x the stake on every payline. Anubis will pay you 200x the bet amount on landing. Next comes the Cleopatra which will pay you 500, 100, 10 or 1 time the stake if you land 5, 4, 3 or 2 of the Egyptian Queen symbols. The golden coloured scarab beetle acts as both wild as well as scatter symbol. If you land 5, 4 or 3 beetles and that too on the same spin, it will fetch you 200, 20 or 2x the stake thereby triggering the Free Spins Round which will give you 10 free spins. Before starting, a sarcophagus will open up and one symbol will get selected randomly. The selected symbol will have magical properties in it which will develop during the feature. As soon as this special symbol will hit, it will expand on and fill up the entire reel if expansion makes up a winning combo. Note that the special symbol need not land on the adjacent reels. If you again land scarab beetles up to three, another 10 free spins will be awarded. This another set will spin when the original will have already spun. For these additional free spins, a new extra symbol will be awarded. There isn’t anything difficult to play with or complex in here. The bold and bright imagery is nicely done with a straightforward gameplay. The variance ranges from medium to high and the highest win can go up as high as 5,000x the stake. Overall, Ancient Egypt Classic is a good one to go for if you like historic themes.